Q. What is the cost of the service? Our base fare from the Ground Shuttle Office to IAH is $35 if prepaid online, if no pre-payment our base fare is $42 (there is a $7 walk up surcharge). If you are traveling to Houston Hobby there is a $10 surcharge. The Ground Shuttle Office serves as our main pick up/drop off location for shuttles going/coming from Houston. The address is 1450 Old Arrington Rd, College Station, TX 77845. Easterwood airport serves as our main pick up/drop off location for Austin shuttles. Our base fare from the College Station Airport to Austin Bergstrom airport is $50 if prepaid online. If no pre-payment our base fare is $57 (there is a $7 walk up surcharge). We offer pick up at other addresses in certain areas of the B/CS metropolitan area (see map below). There is a surcharge of $10 per person for this service. If you are not sure if home pick up is available for your please call our office 855-303-4415. Our system requires you pre-pay your reservation online or through the phone in order to reserve your seat. Drivers have the ability to take payment via cash only for walk-up customers. If you do not have a confirmed reservation and wish to take the shuttle as a walk-up passenger from the airports the price is higher than if you have a pre-paid reservation. Seats are not guaranteed unless they are paid for. Our system requires pre-payment to confirm the reservation. You can pay the driver if you are a stand-by customer and do not have a reservation, however, the price is higher when paid directly to the driver. Drivers will only be able to accept cash as payment (credit cards will be accepted during office hours and processed by the office- drivers do not have credit card processing capabilities). Checks are no longer accepted. Online reservations are closed two hours before the trip. If you are traveling from Houston you will need to address the driver directly at the pick up location to buy a ticket before boarding. Q. What is your refund policy for canceled reservations? If a Reservation is canceled, your Ground Shuttle account will be credited according to the schedule below, based on when the cancellation is made online. Our system does not currently have the ability to refund your credit card account. All credits will expire after one year. Ground Shuttle Credits are transferable upon request. Please contact us if you would like to transfer your credit to another passenger or make a reservation using another passenger's credit. We do require written documentation from credit holder before any balance can be transferred. Q. Do you offer child discounts? Yes. Each traveling adult can be accompanied with a half price (50% discount) child. Up to two discounted fares, for children who are 2 and under. Children over 2 pay full price. For all children 7 and under, we offer complimentary child seats by request through your reservation. This request needs to be made at least 24 hours in advance to confirm a car seat. Otherwise we cannot guarantee availability. Children traveling in our vans need to be properly restrained as required by law. Children without car seat/booster seat will not be allowed to travel in our van. No exceptions will be made. Please also share any special requests in the driver notes with your order. Q. Is a reservation required? We are a scheduled ground transportation service. If there are no reservations on a shuttle we will cancel the shuttle. If there are not reservations from the College Station airport we will not stop by the airport. In order to have a confirmed seat a reservation and payment are required. Reservations can be made online at our website or by calling our office at 855-303-4415. If you do not have a reservation you can approach our driver and as long as there is availability we will be gladly accommodate you. Q. Where do you pick up? Ground Shuttle Office - 1450 Old Arrington Rd, College Station Tx, 77845. We pick up in front of the building underneath the big awning. Customer parking is only allowed in the back of the building. There is a $3.25 daily charge for parking. Any vehicles parked in front of the building for more than two hours will be towed at the owner's expense. 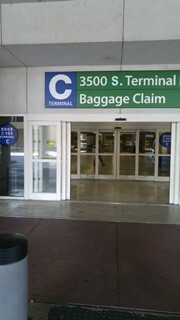 Bush Intercontinental Airport is located at Terminal C baggage claim. Exit the baggage claim through door C-105, The shuttle will pick up between the first 2 columns. 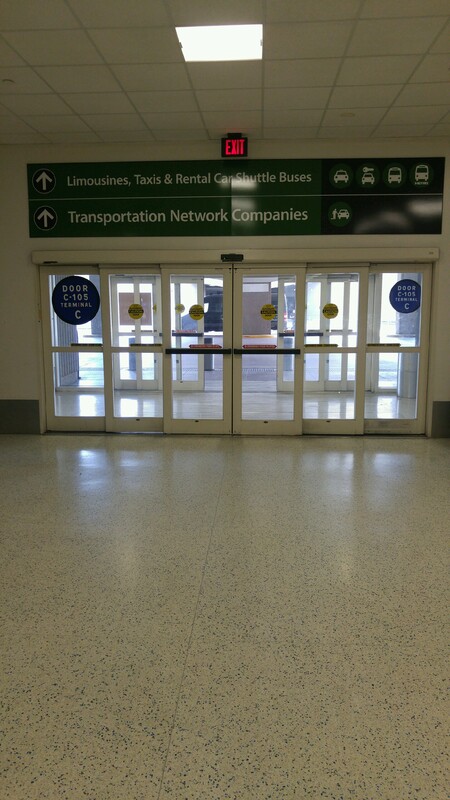 Hobby airport - We pick up at zone 4 Shared Ride. Exit on baggage claim level, make a right and go all the way toward zone 4 "shared ride" sign, right next to the "Spot shuttles"
Austin Bergstrom airport - We pick up at departures (upper level) by the Delta sign. This is the only location we pick up at Austin airport. Q. Can you pick me up at home or an address different from the Ground Shuttle Office? For an additional $10 per person, we can pick you up at an address within our pick up zone, whether it is a home or hotel address. Below is a map of the area we provide pick ups at. If you are unsure if your location is within this area please give us a call in the office (855)-303-4415 and we can clarify that for you. If you are outside our pick up area and make a reservation for a home pick up, we can't guarantee we will pick you up at the provided address and will notify you the evening before your trip if that is the case. Q. At what time should I be ready for a home/hotel pick up? Our scheduled departure times (shown online are from the Ground Shuttle office 1450 Old Arrington Rd College Station, Tx 77845). We start picking up as early as 60 minutes before the departure time. Because this is a scheduled transportation service and there are multiple passengers on our shuttles we can not wait for you if you are not ready. We appreciate your understanding with this matter. If you are traveling to Houston airports - Please be ready an hour before departure time. If you would like a tighter window please call us the day of or the evening before the trip and we can provide a better estimate. When traveling to Houston from Bryan/College Station all passengers (except those picked up at the Walmart in Navasota), will be picked up before the shuttle's departure time from the Ground Shuttle office. Unless you are notified by the office you need to be ready for pick up before the departure time. Q. If I select home pick up, will you pick me up in front of my house? As long as our vehicles can safely access your pick up location we will pick you up as close as possible to your home. However, there are many apartment complexes in town that have gates or roads where our vehicles can not transit safely (due to height and/or lack of space to turn around after picking a passenger up). In these situations our drivers will ask you to wait for them at the leasing office or by the gate for pick up/drop off. We understand this may be an inconvenience for some but safety comes first. Also, some complexes are very big and drivers do not know exactly where every building number is located at so if you live in a big complex and want to be picked up right next to your building, please instruct the driver how to get to it when he calls or provide directions on the "comments" section of the reservation. If you don't answer the phone or don't provide directions, drivers will not be driving around the complex trying to find the building as this could result in delays. Q. Are your scheduled arrival times into the airports accurate? Our scheduled arrival times into the airport are accurate. We schedule our arrival into IAH 2 hours after our departure time from Easterwood airport even though the travel time is closer to 1.5 hours. We schedule our arrival time into AUS 2hrs and 15 minutes after departure time from Easterwood airport even though the travel time is closer to 1.75 hours. There are things during the route we cannot control like traffic, accidents, etc. Please keep in mind we drop off at every terminal in IAH and we cannot guarantee you will always be the first one dropped off. We recommend you give yourself enough time based on your itinerary and airline requirements. If you are scheduled on a flight that departs less than 1.5 hours after our scheduled arrival time we will not be responsible if you miss your flight. Q. What happens if I do not show up at the pick up location before the departure time? For passengers being picked up at an address different from the Ground Shuttle Office in College Station, if you do not answer your phone or are not ready when the driver picks you up your reservation will be canceled and in accordance with our cancelation policy no refund will be provided. If you are departing from the Ground Shuttle Office and are not at the pick up location by our departure time (In front of the building under the awning) the driver will not be able to wait for you and your reservation will be canceled. We will try and accommodate you on the next available shuttle free of charge pending seat availability. If you are being picked up at either of the Houston airports or Austin airport and your flight is delayed please give us a call as soon as you are aware of the delay and we will accommodate you in the next shuttle with available seats free of charge. If for some reason no seats are available we will issue a credit to your Ground Shuttle account. The driver will try and contact you on the number provided on your reservation. If he can reach you before the departure time he can wait up to 10 minutes, we cannot guarantee a longer wait. However, if he can't reach you and you are not at our departure location at the time of departure you will be marked as a "no show" passenger and once you contact us we will try and accommodate you based on your new arrival time. Q. What time will I be picked up at the Ground Shuttle Office? Our published departure times are from the Ground Shuttle Office. We ask you to please be at the office, standing in front of the building under the awning, 10 minutes before published times in order to board all passengers and accommodate their belongings. Our office hours are M-F 7:40am-6:30pm, Sat 8:30am-5pm and Sund 8:30am-5:30pm. Our phone service is M-F 7am-9pm, Sat 8:30am-5pm and Sund 8:30am-8:30pm. If you book a shuttle before our opening time, you will have to wait outside the doors. If you have requested a pick up at our office and you are not at the pick up location at departure time your reservation will be cancelled and your seat can be assigned to a stand-by customer. We may depart from the office ahead of schedule if all reserved passengers have boarded our van. Q. If my flight is delayed, what should I do? If you are being picked up at either of the Houston airports or Austin airport and your flight is delayed please give us a call (as soon as you are aware of the delay) and we will accommodate you in the next shuttle with available seats free of charge. If for some reason no seats are available we will issue a credit to your Ground Shuttle account. If for any reason you can not contact us via email (reservations@groundshuttle.com) or phone (855) 303 4415 and you miss your shuttle please proceed to our pick up location and inquire directly with the driver if there is availability. Q. When will I arrive to my drop off location? Our schedules published online estimate an arrival into the Ground Shuttle Office airport 2 hours after departure from IAH. Once we arrive in College Station, if we are coming from Houston we drop off from south to north. Our first drop off will usually be the Ground Shuttle office, however, if we have passengers who live In Pebble Creek or Indian Lakes (they have easy access from the highway) we may drop them off before the stop at our office. This decision is up to the driver and living in either one of these locations does not always guarantee first drop off. If you are returning from Austin our first stop will be the Easterwood airport. Home drop off's will be determined by the driver based on the passengers who have requested this service. Q. How many bags/suitcases am I allowed to bring with me? You are allowed to bring a regular size suitcase, a carry-on bag and a personal item (purse, small backpack). A personal item is defined as a small bag/laptop bag/purse/ backpack that fits on your lap. If it needs to go in the cargo compartment it will be counted towards your bag allotment. There is a charge of $10 for each extra bag if paid online and $15 if paid directly to the driver. We will guarantee we will accommodate your additional luggage if prepaid 24 hours before the trip and if you keep your original reservation. We can not guarantee there will be enough space to accommodate excess luggage if not paid at least 24 hours before the trip or if you change your shuttle reservation to a different time less than 24 hours before the trip. If in doubt please contact us. Q. Why do I need to input a phone number when I make my reservation? Does it need to be a US number? Our drivers will text/call you to let you know they will be picking you up a few minutes before they arrive at your requested pick up location. If you are not at the pick up location (including the College Station airport) when the driver arrives and do not answer his calls or text messages he will not wait for you. It is extremely important you answer our driver's attempts to reach you. If he does not hear back from you he is instructed to leave and continue his route. Your reservation will be cancelled at that time (see refund policy for above for refund related questions). Please make sure you provide a valid US number, we can not contact international numbers. Q. Can I still register in your system without a US Cell phone number? Yes, you can type 000-000-0000 and choose any carrier, this will allow you to complete your reservation. If at a later date you contract cell phone service with an US service provider please update your information in your Ground Shuttle account. Q. Can I have a specific seat in the shuttle reserved for me? Our policy is open seating on every trip unless indicated by the driver. Q. Are pets allowed on your vehicles? Service dogs are allowed please notify over the phone when you make your reservation. Small pets (less than 8lbs and in a carrier that can go on your lap) are handled on a case by case basis. Please call our office to confirm if your pet will be allowed on the vehicle. Large pets are NOT ALLOWED for any reason!!! Drivers feel appreciated when a customer recognizes their efforts. We do not discourage this practice. Q. Is food or drink allowed on our vehicles? As a courtesy to other passengers we only allow dry snacks and drinks in containers with lids. Please dispose all other food before boarding our vehicle. Q. How does the wait-list work? Once you add your name to the waitlist you will be automatically notified via e-mail if a seat becomes available. You will need to call us or visit our website and complete your reservation to confirm a seat. If you have an existing reservation and would like to transfer to a different shuttle please call us or e-mail us and we will be glad to help. Q. What is a "depot" location? A depot location is any location other than a home pickup. This is typically an airport location, but it can be a hotel or other special locations as designated in our system. Q. Do you have other schedules besides the ones posted on line? You can set your own schedule with our charter service. We can pick you up from your house or specified location within our service area at any time (day or night) and take you to or bring you from Houston airports. View our Charter Service page for more information. Q. Can I park at the Ground Shuttle Office? Yes, you can park in the back of our building, our new office offers fenced in parking for customers. The only parking allowed in front of our building is short term parking (less than an hour). All unauthorized vehicles parked in these spots will be towed at the vehicle owner's expense. Q. Is there a charge for parking at your office? Yes. We only offer paid parking. The rate is $3.25 for 24 hours. Q. What happens if I loose my parking ticket? There is a lost ticket fee of $299. Q. Where do I pay for parking? We only accept credit card payment. You can pay at the kiosk right by our back door or at the box by the lot exit. Q. Is your lot monitored? We have cameras in key places around our lot as well as a security fence. However, we encourage customers to use judgement and not leave any valuables in your vehicles. We are not responsible for damages to your vehicle or loss of any valuables.